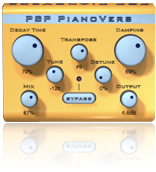 PSP PianoVerb an award-winning free reverb plug-in for any VST, AudioUnit, RTAS host by PSP! PSP PianoVerb reproduces special kind of reverberation originally provided by piano strings. It generates reverberation using twelve string operators with adjustable damping and decay time. Each of them is tuned to a particular note starting from A(55Hz) to a G#(103.8Hz). The PSP PianoVerb string system can be transposed in the range of +-24 semitones, tuned within a range of +-100 cents and be detuned as well. Transposing to lower octaves produces a bigger and less resonant sound similar to traditional reverbs, while in turn transposing to higher octaves produces a very bright harp-like effect.